Keepsake quilting introduces you to traditional quilting techniques in the twenty-first century. We will share with you the proper steps that will allow you to build a quilt top in the right order, using the right tools, and no matter if you are a beginner with little experience or just need to refresh your knowledge. Growing up, a needle, thread, thimble, and scissors were all the tools needed. Today, modern technology adds a wealth of useful time and labor saving goodies that makes keepsake quilting easy. We show you how. It's true; you don't have to be an artist to be a quilter. You do have to know how a quilting pattern comes together and we plan to introduce you to each step...but you have to look through each page to learn. The fun part of making a keepsake quilt is learning all the techniques. The know-how is transferable from pattern to pattern. Once the quilt top is finished we introduce you to the finishing steps such as making the quilting sandwich and then adding the borders, binding and yes even quilting the sandwich together. There's something about this challenge that swells the soul! When it comes time for you to quilt your project, be sure to browse through the machine quilting patterns and the continuous line quilting patterns featured on this site. At the moment this may seem like an impossible task but you soon will be selecting the perfect stitching patterns to compliment your quilt top. You'll quickly learn how to mix and match different rulers to make stitching designs as shown here in our stitching sampler. I suspect you are attracted to keepsake quilts because they revel in exquisite designs that date back to your parents, grandparents and beyond. The art of quilting started in America when the first settlers arrived in the new world seeking to piece together a new life for themselves and their families. Once you become a quilter, you will appreciate a craft that has evolved over time. First, out of necessity in order to keep warm and then became a form of art that hangs on walls, hand-made gifts for the newest member of the family and yes even sharing your talents in the form of a pay back of appreciation for many, many causes. 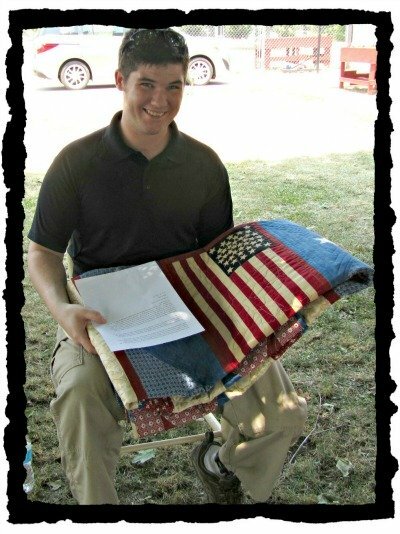 Visit the Quilts of Valor Foundation and see how you can help our wounded warriors. Show your support to our veterans with a beautiful quilt. It is our pledge to support everyone that gets involved through our web site for the QOV Foundation. We will publish your write-up and your photo of any shop owner, organization, or individual, that contributes a QOV quilt to a wounded warrior. We will also support feed-back from the soldier telling their story along with their picture(s) if they wish. For quilters there seems to be an unquenchable thirst for knowledge, building friendships, developing skills, and even sharing freebies and quilting tips. Once a project is finished it is fun to boast and display your accomplishments. You'll see!That is why we enjoy sharing freebies and quilting tips in our monthly newsletter. In every issue you will discover techniques, patterns and lots more. Go ahead and give us your e-mail address and we will include you in our next mailing. You're sure to find interesting tips and how-to information. If you tried any of our free patterns or felt our web site has been helpful or maybe got you started with learning how to put together a quilt, we invite you to become a member of our coffee club. Help us help you! We hope you feel our site is worth a good cup of coffee; can you smell it? There is nothing like the aroma first thing in the morning and buying us a cup of coffee is a vote of confidence. We value your belief in us and our abilities. Art and Stitch design software for longarm quilters and machine embroiderers! Easy quilt patterns that look great, are easy to make, and cost just pennies! How do you decide to use a machine quilting service? Quilting can be the best part of the project but requires a higher skill level! Christmas quilt patterns is always a fun project and chuck full of great ideas in the most fun time of the year! Easy kids patterns is chuck full of digital designs and baby quilt patterns for quilters with a computerized quilting system. Easy machine quilting patterns for beginners as well as advanced quilters. Holiday patterns for year round enjoyment using digital patterns on a computerized quilting system. Easy machine quilting patterns page2 is chuck full of patterns for beginners as well as advanced quilters. Hand Quilting Stitches that are unmatched for soft curves, angles and density. Learning how to machine quilt with Online quilting classes. Longarm quilting patterns are used with longarm quilting machines to create exciting quilts at an astonishing speed.. It's all about squaring the quilt backing. If not, chances are you're off to a crooked start. Quilt Batting is the secret layer in a quilt. It places special emphasis on the quilting stitches and will support your quilt through the generations. How to handle quilt binding cut on the bias. Binding a quilt is the last step for your quilt. Quilt borders are unlimited in style and adds dimension to quilt designs. Learn to quilt...develop a callous. Quilters use 100's of quilt-magic techniques. Learning how to make a quilt| is quite simple once you select the right pattern. Uncover the History of Quilting by Following the Events of the Time. The Quilts of Valor Foundation is a nonprofit organization whose mission is to cover ALL service member warriors. Baby Quilt Patterns using quilting panels are easy quilts to make that are an emotional and fun sentimental journey. All t-shirt quilts involves selecting the shirts that will tell the story. 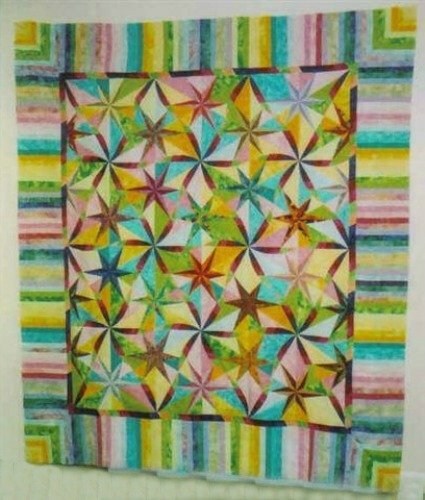 Some of the best quilt ideas will have a repeat block pattern. This log cabin quilt pattern holds secrets just waiting to be shared with beginners. Quilting tools allow us to grow and become expert quilters. Build a Quilt Design Wall that gives you the big picture from afar. Using a design wall solves the logistics of trying to visualize before sewing. Any quilt is best when shared. Submit your photo to our quilt gallery so others can rant and rave! Quilting pantographs with innovative and inspiring digital designs to beautify your quilt top. Quilting Projects Honoring Our Veterans From "The Cherry Pit"
Join us with a value link exchange. Apart we are many, together we are one! Building a web page can be a daunting task unless, unless you know what I know! I'm a senior with minimum computer skills and maximum blocks of time. baby designs that are sure to bring out the kid in all of us! We offer many baby designs plus many of digital designs for those who love computerized quilting. Nothing more than small pieces of fabric sewn together to form an image.